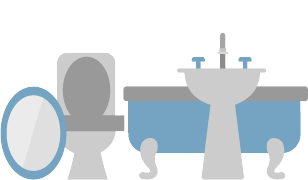 A huge amount of bathroom waste can be recycled — whether that’s wood, glass, plastic, or copper pipe — which is something we are really passionate about. When you hire a skip from us, you’re also helping us take care of the environment. We work alongside a number of reputed recycling plants to ensure that as much of your waste is recycled, re-used or repurposed as possible. Take a look at our recycling page for more information on exactly what will happen to your waste once we’ve collected it. Unless your bathroom is exceptionally large (lucky you), the 6-yard skip is likely to be just about perfect for accommodating any waste you produce in the refurbishing process. If necessary, most of your old bathroom can be broken down into smaller pieces for easier handling and disposal. The only other thing to remember is that any plasterboard you’re getting rid of will need to be put into a separate bag and placed on top of the skip for collection. If that sounds like a lot to remember, don’t fret; you can always call up one of our friendly team for any advice, or alternatively, you can book our assisted waste removal service for some hands-on help on-site. Simple!